Thanks for your interest in contacting EdTechTalk. I've been a member of EdTechTalk for a while. I love the idea of TTT. I've been doing it since 2006 on my own Moodle site. I organize MOOCs, online conferences, courses, and blog festivals. How do I contribute to TTT? Sorry to hear about your frustrating experience with tonight's webcast. You should not have to register or login with EdTechTalk in order to participate in the text chat. 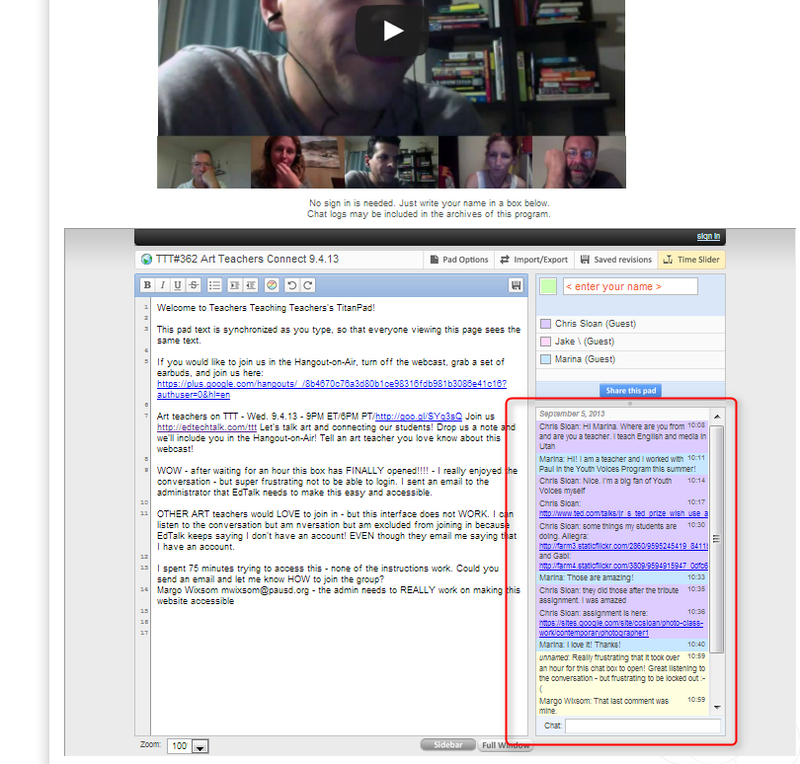 When you went to http://edtechtalk.com/live, did you see the chat room below the video? (see screenshot below). As far as registering/logging in to the site, I see you were able to log in shortly after sending your last email. Were you getting that 'account not found' message before or after clicking the link sent in the authorization email after registering? Once that is clicked, you should be able to log in. Any comments you make with be queued until a moderator approves them and then sets your account permissions to 'trusted user' (which you now are). We do that in order to minimize spam on the site. Can you share how best to make poodcasts such as yours? 1) when using skype, what audio recording device do you utilize to get everyone recorded? What setting on that device? 2) Your flash audio players, how did you generate those?